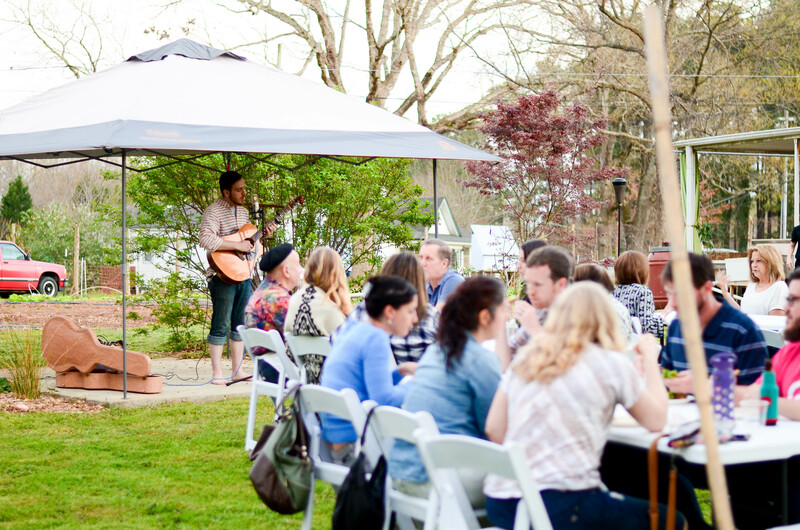 Irregardless Catering hosts private events at The Well Fed Community Garden – Socials, Birthdays, Corporate Team Building, Weddings and more. Invite your guests or business associates to the Garden, with its large lawn, cement patio and pizza oven between the gardens and greenhouses at the back of the house. An event in the Garden may simply be a ‘back to the land’ location for your meeting and meal or may also include options listed below. • Casual meals featuring Pizzas baked on the spot in the Garden’s Pizza oven with garden fresh salad, and dessert choice of freshly baked chocolate chip cookies and/or fruit cobbler ~ $20/person. • Receptions and 3-5 course garden meals prepared and served by Irregardless’ Catering Division ~ $80 +/person, depending on menu selection and number of courses. • Prepaid or cash wine, beer and cocktail bar available. • Tours of the Garden’s vegetable, fruit & berries, mushrooms, hydroponic, pollinator gardens and composting/vermiculture facilities. • Garden Cooking Classes with Irregardless’ Chef Arthur. • Hands-on activities with knowledgeable interns on nutrition, planting and cultivating vegetables and fruits, healthy soil maintenance, mushroom cultivation, beekeeping, cooking demonstrations, story-telling and more. • Live musical entertainment can be arranged to create a friendly, enriching experience. My husband and I attended The Well Fed Community Garden’s Farmily Farm Lunch today and we loved it! So happy! The Garden Manager there even sent me on my way with a Mountain Mint plant which is already planted in my bee /butterfly garden. Thank you so much! The price of admission was nothing for the experience we received. Raleigh is AWESOME! ( moved here 2 yrs ago from AZ by choice for weather and more ). We haven’t even been to the restaurant yet! We even met another couple like us, transplants, and hopefully, we’ll get together soon! You could really feel the sense of community. I think an urban garden like this can help people with depression, addictions, divorce, loss of a loved one.… It’s all about planting a new root, growing, flowering, reaping and connecting. We LOVED it! Thank you so much. Best $23 I have spent! Thank you Arthur and Anya. I didn’t even know you were the owners or I would have asked for an autograph. I respect people like you so much. At least now I have my mint to remember you by.